Home Events 20 August First use of kiwi as unofficial national symbol? 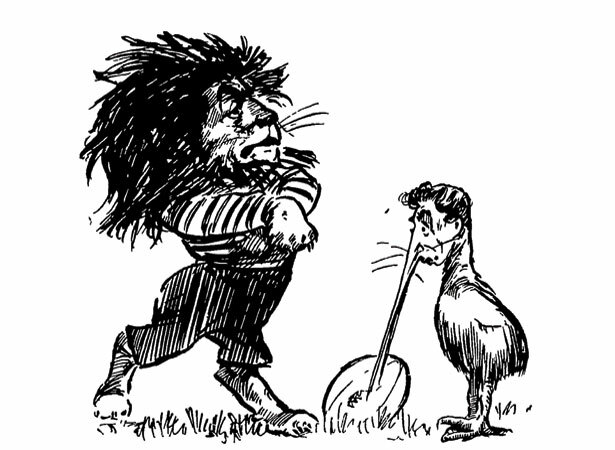 The New Zealand Free Lance printed a J.C. Blomfield cartoon in which a plucky kiwi morphed into a moa as the All Blacks defeated Great Britain 9–3 in the first rugby test between Motherland and colony. This may have been the first use of a kiwi to symbolise the nation in a cartoon. In 1905 Trevor Lloyd repeated this trope by depicting a kiwi unable to swallow Wales after the All Blacks’ controversial loss in Cardiff. When the ‘Originals’ won, they were shown as a moa. Also in 1905, the Westminster Gazette broadened the imagery by depicting a kiwi and a kangaroo setting off for a colonial conference. By 1908 the kiwi was the dominant symbol for New Zealand in cartoons, especially sporting ones, having replaced images of moa, fern leaves, a small boy and a lion cub. The New Zealand representative rugby league team was dubbed the Kiwis by a journalist in 1921 and has officially had this name since 1938. The 1945–46 2NZEF rugby team was also known as the Kiwis. We have 17 biographies, 8 articles, related to First use of kiwi as unofficial national symbol? . RELATED TO FIRST USE OF KIWI AS UNOFFICIAL NATIONAL SYMBOL? No comments have been posted about First use of kiwi as unofficial national symbol?